I worked on Cherry Hill some last night and today. I've mostly been stitching grass. I'm almost done with that thankfully! Of course I had to make a matching fob! I need my head examined! LOL! :) Well, not much else going on here. Just hanging out with the kids! Write later! You're really making fast progress. Love the fob, really pretty! If it's any consolation, I have an extensive scissor collection and use a pair that matches my project! Cherry Hill is lovely, as is the fob! Very cute, indeed! The fob looks gorgeous and I must say that the one you gave me for Christmas is my favorite fob I own... and I mean that seriously. Cherry Hill is adorable--there you go again, enabling me. LOL And your fob matches perfectly--great job. How do you find the time? The fob is really pretty, and matches perfectly. 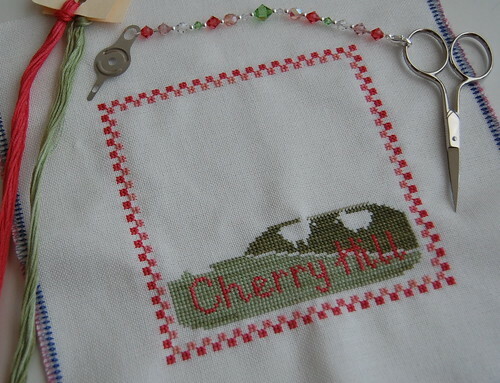 Cherry Hill is on my wishlist, and it climbs higher each time you post a picture. Making great progress on Cherry Hill! Very pretty colors. I love the fobs that you've made to "match" your stitching! I was just wondering what size bead are you using for the largest one in the middle?? I do love how you match all your fobs to your project!